September 28 2011: Be sure and read the comment section, especially the comments by Richard Lawrence, who shares with us a seemingly lost verse from the original version of this poem. June 6 2009: Tweaked and expanded. I’ve been following the lead of my readers, noting on the Stats page what searches you use to find my blog. 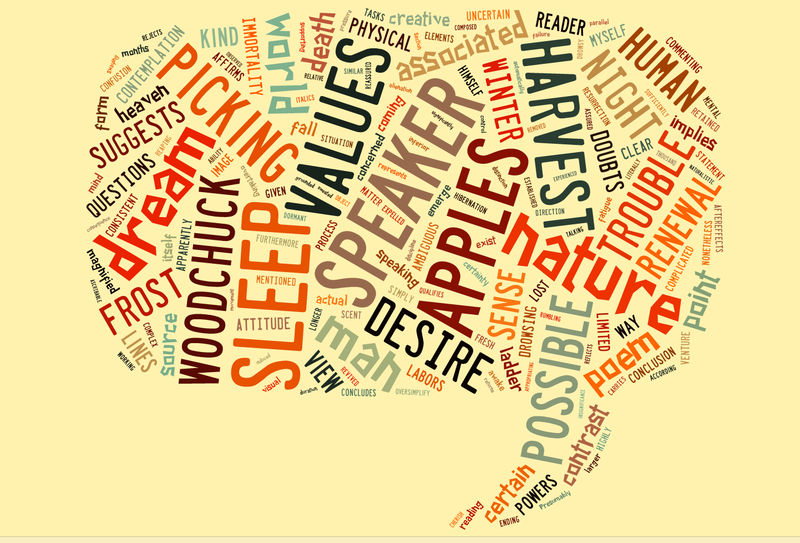 The most popular poet remains Robert Frost. And I’ve noticed several searches for Frost’s “The Pasture”. There are few poems in the English language that can compare. Right now? I can’t think of one. In terms of brevity and memorability, it’s unsurpassed. Why? Subject matter, rhyme and meter are perfectly suited to each other. One spring evening in 1905, Frost took a walk over those fields with his wife, Elinor, and their six-year-old daughter, Lesley. 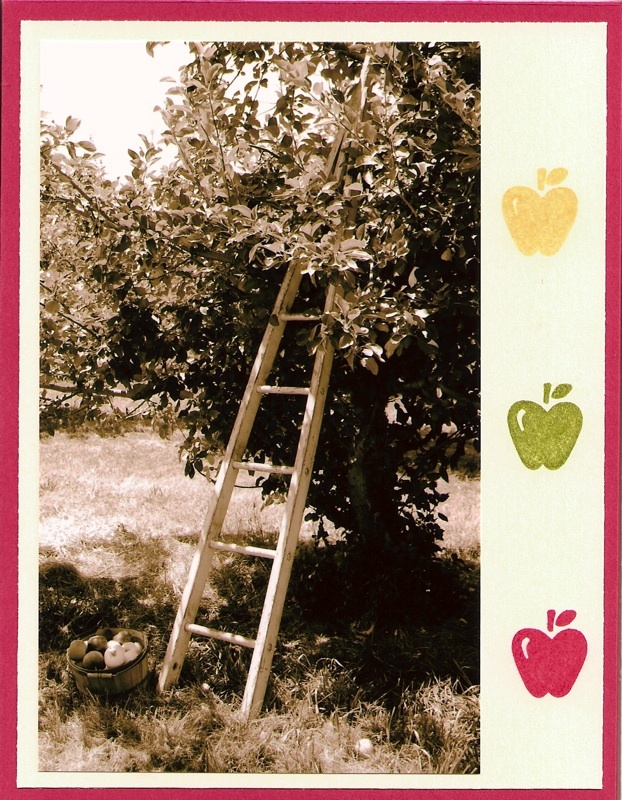 According to the notebook Lesley kept as a child, she and her mother picked apple and strawberry blossoms while her father went down to the southwest corner of the big cow pasture to check on how much water was in the spring. In 1910, when Frost wrote “The Pasture” he used a walk to a spring in a cow pasture as its centerpiece. The experience was still a favorite memory thirty years after he wrote about it. In 1940 he reminisced, “I never had a greater pleasure that coming on a neglected spring in a pasture in the woods. Newman’s introduction to the poem continues and I wholly recommend the book as a companion to his poems. But what does the poem mean? (It never seems enough to say that the poem means what it says.) It’s a poem of invitation first and foremost – Frost chose this poem as a sort of introduction and invitation to his collected poems. More than that, the poem typifies what many readers love the most about Frost: his connectedness with nature and the everyday; his contemplative ease; and, above all, the approachable content of his thought and poetry. Frost was a poet with whom most everyone felt a kinship and understanding. He was comprehensible during a time when poetry was becoming increasingly incomprehensible. Saying he won’t be gone long could summarize his craft. There are depths to his poetry, but they are such that the reader returns. He won’t go too far. He won’t be gone too long. You come too, he says to the reader and to anyone who wants to go with him. In point of a fact, I write my own poetry with the vowel sounds in mind. I hear words as music and tones, which makes me an “ear reader” rather than an “eye reader”, as Frost put it, and a very slow reader. Who are but weasels fighting in a hole. Who are the mindful servants of the soul. Not so “helter-skelter” now, is it? In a book review or essay, committing this particular fallacy is a minor error. Most critics do it regularly (I certainly have). In a book that sets out to explain why a poet makes particular formal choices, however, the mistake is more serious, because it replaces the complex relationships among a poem’s elements with just-so stories in which it always turns out — surprise! — that meaning has been mirrored by shape and sound. Think of it this way: we don’t enjoy a bowl of gumbo because it “feels” exactly the way it “tastes”; rather, we find the combination of “taste” and “feel” pleasing. Similarly, a particular stanza arrangement can reinforce our experience of a poem, but only because that arrangement is working in harmony with the poem’s other aspects. I quote the better part of the passage because I think it’s something every novice in poetry and poetry criticism should be aware of. Read all criticism and analysis with skepticism. 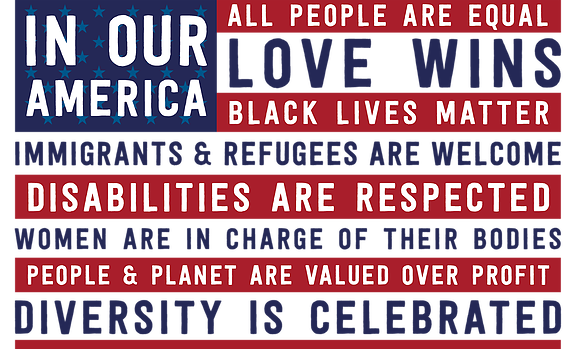 Including, obviously, mine; though I try to be reasonable in my assertions. Anyway, back to Frost and The Pasture. Whether intentional or not, the first line’s variety of vowel sounds is lovely – no two are repeated. That in itself isn’t so remarkable, but what happens next, to me at least, beautifully sets off the first line. The two lines are rich with internal rhyme – the long A’s of rake, away, wait and may bracket the short, rhyming vowel sounds of stop, away, watch and water. The effect of these internal rhymes (interlocking in the second line and bracketed in the third) will be different for different readers, though I think all readers, but those with tin ears, will register them. To me the internal rhyming creates a sort of sing-song effect in perfect keeping with the light-hearted, carefree, teasing tone of the poem. And, again for me, the “long A” vowel sound has a sort of easy-going and open feel to it. There’s no way to know whether Frost had this in mind, but I’m sure that the music in the lines, however he interpreted their effect, was intended. I sha’n’t be gone long. (You) come (too). Up to this point, the lines have been Iambic Pentameter. But the fourth line (repeated in the second stanza) is Iambic Tetrameter. The effect is lovely and though it can be imitated in free verse, it can’t be reproduced. The first three lines could be spoken to an unnamed companion or to oneself. We read the poem in the same manner that we read first person narratives (where our presence is irrelevant to the narrator). But then Frost does something magical. He talks explicitly to “you” and he does so in Iambic Tetrameter. “You come too”, he says, and the shortened tetrameter line has same effect as an aside in a play or drama – an effect of immediacy and personableness. Suddenly we find ourselves in the poem! The internal rhyme of gone and long anticipate and are complimented by You and too. The musicality of the line heightens the feeling of intimacy, unselfconsciously inviting – the appeal of a close friend. And, as a final note, notice too how the Iambic pattern is broken in the last two feet (spondaic variant feet) of the Tetrameter line. I sha’n’t |be gone |long. You |come too. This too adds to the air of informality. The formal Iambic Pentameter is broken for the sake of a friendly aside. The ceasura (the break between the two sentences), occurs in the middle of the third foot, also disrupting the metrical pattern of the previous lines. It all contributes to the informal, intimate feel of the fourth line. Again, it’s an effect that free verse simply can’t equal. Instead of saying “I’m going out to clean the spring in the pasture”, he says “pasture spring”. Pasture, normally a noun, becomes an adjective modifying spring. Et viola! Anthimeria! If you read enough of Frost’s poetry you will see this figurative language recur again and again. And if you hang about Vermont, New Hampshire or Maine, and hear some old-timers, you will hear this same grammatical short-cut. I don’t know why it’s more prevalent in New England (more so than in other regions of the United States) but it may be a hold over from the speech patterns of a much older generation. Anyway, Frost always keenly observed, recorded and remembered the speech habits of New Englanders and deliberately infused his own poetry with the patterns he heard. Techniques like anthimeria, the substitution of a noun for an adjective, helps give his poetry a dailectal and colloquial feel. In a similar vein, the contraction sha’n’t, for shall not, adds to the colloquial informality and intimacy of the poem. “I sha’n’t be gone long” is a style of speech that’s almost gone. Probably more typical of what was heard among an older generation of New Englanders if only because the region is where American English is the oldest. It totters when she licks it with her tongue. I (sha’n’t) be gone long. You come too. If this post has been helpful to you; if you enjoyed; if you have suggestions or questions; please comment! If scansion is new to you, check out my post on the basics. February 22, 2009 – If you enjoy Frost, you might like reading Birches along with a color coded scansion of Birches included in my post on Frost’s Mending Wall. To find all the posts I’ve written on Robert Frost, click here. After you’ve read up on Robert Frost, take a look at some of my poetry. I’m not half-bad. One of the reasons I write these posts is so that a few readers, interested in meter and rhyme, might want to try out my poetry. Check out Spider, Spider or, if you want modern Iambic Pentameter, try My Bridge is like a Rainbow or Come Out! Take a copy to class if you need an example of Modern Iambic Pentameter. Pass it around if you have friends or relatives interested in this kind of poetry. April 23 2009: One Last Request! I love comments. If you’re a student, just leave a comment with the name of your high school or college. It’s interesting to me to see where readers are coming from and why they are reading these posts. 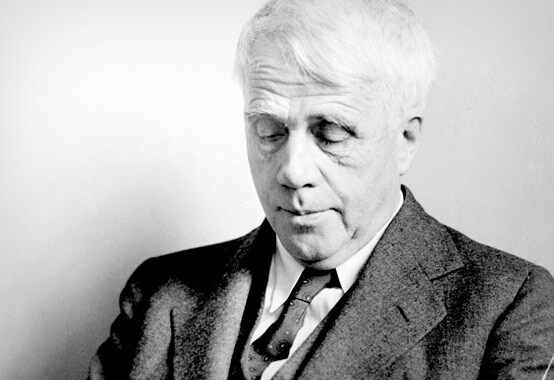 April 25 2009: Audio of Robert Frost added. One of the loveliest poems in the English language is Frost’s The Road Not Taken. Part of the magic is in how Frost loosens meter to obtain a more colloquial tone. In one of the most enjoyable books I own (among books on Frost) Lea Newman relates that according to a survey of 18,000 written, recorded and videotaped responses, this poem (along with Robert Frost) is America’s most popular poem – a probably more accurate poll than the self-selected poll done by poets.org. Lea also writes that Frost’s intent, in writing the poem, was to satirize his friend, Edward Thomas, who would frequently dither over which road he and Frost should walk. (Edward Thomas was an English poet who Frost befriended while living in England). 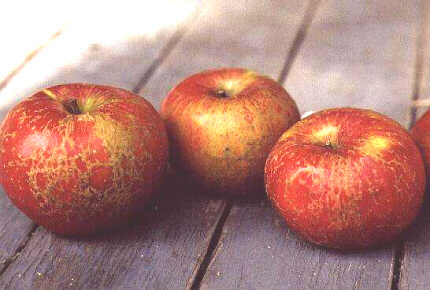 Frost completed and sent the poem to Thomas only after he had returned to New Hampshire. Thomas, however, didn’t read the poem as satire and neither have other readers coming to the poem for the first time. I personally have a hard time taking Frost’s claims at face value. If you don’t see a play button below, just copy and paste the URL and you will be able to hear the recording. Two lonely cross-roads that themselves cross each other I have walked several times this winter without meeting or overtaking so much as a single person on foot or on runners. The practically unbroken condition of both for several days after a snow or a blow proves that neither is much travelled. Judge then how surprised I was the other evening as I came down one to see a man, who to my own unfamiliar eyes and in the dusk looked for all the world like myself, coming down the other, his approach to the point where our paths must intersect being so timed that unless one of us pulled up we must inevitably collide. I felt as if I was going to meet my own image in a slanting mirror. Or say I felt as we slowly converged on the same point with the same noiseless yet laborious stride as if we were two images about to float together with the uncrossing of someone’s eyes. I verily expected to take up or absorb this other self and feel the stronger by the addition for the three-mile journey home. But I didn’t go forward to the touch. I stood still in wonderment and let him pass by; and that, too, with the fatal omission of not trying to find out by a comparison of lives and immediate and remote interests what could have brought us by crossing paths to the same point in a wilderness at the same moment of nightfall. Some purpose I doubt not, if we could but have made out. I like a coincidence almost as well as an incongruity. The poem is written, nominally, in Iambic Tetrameter. Nominally because Frost elegantly varies the meter to such a degree that readers may only glancingly hear the imposition of a metrical pattern – the effect is one of both metrical freedom and form. I have based my scansion, by the way, on Frost’s own reading of the poem. I suppose that might be considered cheating, but Frost’s own conception of the poem interests me. March 28 2011 • Given some time and a conversation with a reader and poet Steven Withrow (see the comments) I’ve changed the scansion of the last stanza to reflect the way Frost probably would have scanned the poem (rather than how he read it). The new scansion, immediately below, retains the tetrameter meter throughout (more on how later). You can still find my old scansion at the bottom of the post. Decide for yourself which scansion makes more sense. As for myself, I lean toward the new scansion. All unmarked feet are iambic and all feet in blue are anapests. The first element to notice is the rhyme scheme and overall structure of the poem. The poem is really four stanzas, quintains, each having the same rhyme scheme – ABAAB. 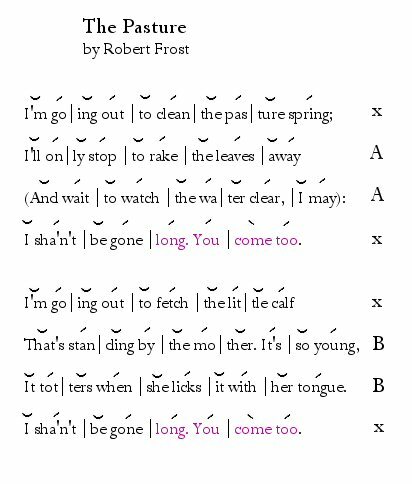 The nested couplets within the stanzas subliminally focus the ear, while resolution to the pattern is found in the final rhyme. The overall effect of the rhyme scheme is analogous to that of the Petrarchan Sonnet. That is, rather than springing forward, the internal couplets produce the effect of rounded thought and reflection – a rhyme scheme suited to Frost’s deliberative intellect. The same point I made in my post on Sonnet forms, I’ll make here. In the hands of a skilled poet, rhyming isn’t about being pretty or formal. It’s a powerful technique that can, when well done, subliminally direct the listener or reader’s ear toward patterns of thought and development- reinforcing thought and thematic material. In my own poetry, my blank verse poem Come Out! for example, I’ve tried to exploit rhyme’s capacity to reinforce theme and sound. The free verse poet who abjures rhyme of any sort is missing out. The first three lines, metrically, are alike. They seem to establish a metrical pattern of two iambic feet, a third anapestic foot, followed by another iambic foot. The use of the singular wood, instead of woods, is a more dialectal inflection, setting the tone for the poem with the first line. The third foot surrounded by strong iambs, takes on the flavor of an iambic variant foot. After the first two lines, the third line could almost be read as strictly Iambic. This would be an example of what Frost would consider a loose Iamb. If read one way, it’s an anapest, if the word is elided – trav‘ler – it creates an Iambic foot. Although I don’t think it’s deliberate (Frost didn’t go searching for a word that could create a loose Iamb) but the ambiguity subliminally encourages the ear to hear the more normative meter of Iambic Tetremater. Frost will play against and with this ambiguity throughout the poem. - ! ! - - - ! - ! If one is going to put the emphasis on one, choosing to ignore the metrical pattern (which one can do), then it seems arbitrary to insist on reading traveler as a three syllable word. If one is going to put a modern interpretive spin on the poem, then I would opt for a trochaic second foot and elide traveler so that the line reads the way most of us would read it. In the fourth line of the first quintain, Frost allows an anapest in the final foot, offsetting the pattern established in the first two lines. Curiously (and because the other feet are Iambic) the effect is to reinforce the Iambic Tetrameter patter. There is only one line that might be read as Iambic, but because the other feet, when they aren’t variant anapests, are Iambic, Frost establishes Iambic Tetrameter as the basic pattern. The final line of the quintain returns the anapestic variant foot but, by now, Frost has varied the lines enough so that we don’t hear this as a consistent pattern. It’s worth noting that, if Frost had wanted to, he could have regularized the lines. Compare the sound of these regularized lines to what Frost wrote and you might begin to sense how the variant feet contribute to the colloquial tone of the poem. 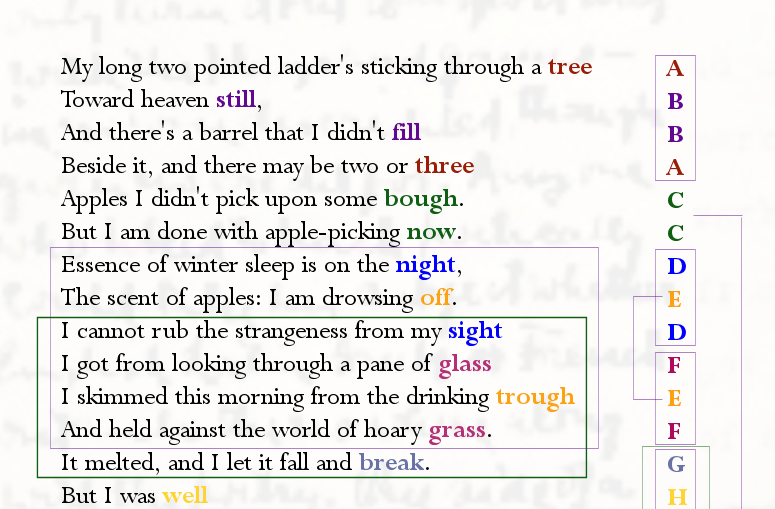 Regularizing the lines, to my ear, takes some of the color from the poem. 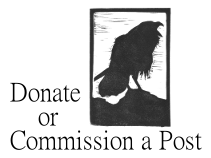 The anapests encourage the reader to pause and consider, reinforcing the deliberative tone of the poem – much as the rhyme scheme. It’s the play against the more regularized meter that makes this poem work. As I’ve written elsewhere, a masterfully written metrical poem has two stories to tell – two tales: one in its words; the other in its meter. The meter of The Road Not Taken tells a story of pause and consideration. Its an effect that free verse poetry can approximate but can’t reproduce, having no meter to play against. The second quintain’s line continues the metrical pattern of the first lines but soon veers away. In the second and third line of the quintain, the anapest variant foot occurs in the second foot. The fourth line is one of only three lines that is unambiguously Iambic Tetrameter. Interestingly, this strongly regular line comes immediately after a line containing two anapestic variant feet. One could speculate that after varying the meter with two anapestic feet, Frost wanted to firmly re-establish the basic Iambic Tetrameter pattern from which the overal meter springs and varies. What’s worth noting, as well, is how beautifully Frost manages a colloquial expressiveness in this poem with expressions like having perhaps, Though as for that, really about. After setting the location in the first quintain, the self-reflective expressions, new to poetry up to this point, create a feeling of shifting ideas and thought, of re-consideration within the poem itself – as if the speaker were in conversation with himself and another. Colloquial, in fact, is “considered to be characteristic of or only appropriate for casual, ordinary, familiar, or informal conversation rather than formal speech or writing.” It’s an effect that has been touched on by other poets, but never with such mastery or understanding as Frost demonstrates. Expressions like better claim , wanted wear and the passing there add a New England dialectal feel to the lines. Again, it’s worth noting the Frost probably could have regularized the lines, but he might have had to sacrifice some of the colloquial feel reinforced by the variant anapestic feet that give pause to the march of an iambic line. Had worn |them just |about |the same. Notice how, at least to my ear, this metrically regularized version looses much of its colloquial tone. Had really worn them just about the same. Had just about worn them the same. In the third quatrain, the first line can be read as a loose Iamb if we elide equally to read equ‘ly – making the line Iambic Tetrameter while the second is solidly so. After two more regular lines, Frost once again diverges from the pattern. The third and fifth lines are pentasyllabic though still tetrameter, each line having two anapests. Interestingly, as with the second quintain, Frost never seems to vary too far from the pattern without reaffirming the basic meter either before or after the variant lines. The interjection Oh is entirely unnecessary strictly in terms of the poem’s subject matter. Lesser poets writing meter might have omitted this as an unnecessary variant, but the word heightens the colloquial feel of the poem and is very much in keeping with the poem’s overall tone and them – echoed in the first line of the final quintain – a sigh. 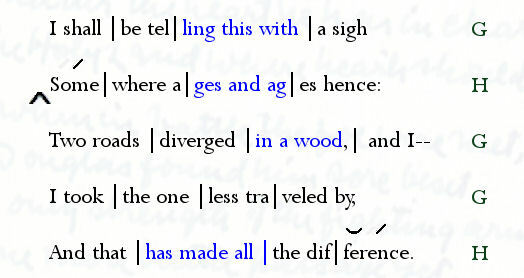 The second and fourth lines are actually Iambic Trimeter, but once again Frost reaffirms the meter from which they vary by placing a solidly Iambic Tetrameter line between them (the fourth line). Two things to notice: In the second line I’ve read the first foot as headless. This is a standard variant foot that can be found with the Elizabethans. Some call it anacrusis. A headless foot means that the first syllable of the foot is missing. Second, the last line is changed so that difference, at least on paper, is pronounced trisyllabically as diff/er/ence, rather than diff’rence. This makes the line tetrameter and makes the final rhyme a perfect rhyme. Frost sometimes took criticism from more strictly “Formalist” poets (including his students) who felt that his variants went too far and were too frequent. In either case, whether you can it the way Frost read it or according to the underlying meter and rhyme scheme, Frost’s metrical genius lay preciely in his willingness to play against regularity. Many of his more striking colloquial and dailectal effects rely on it. 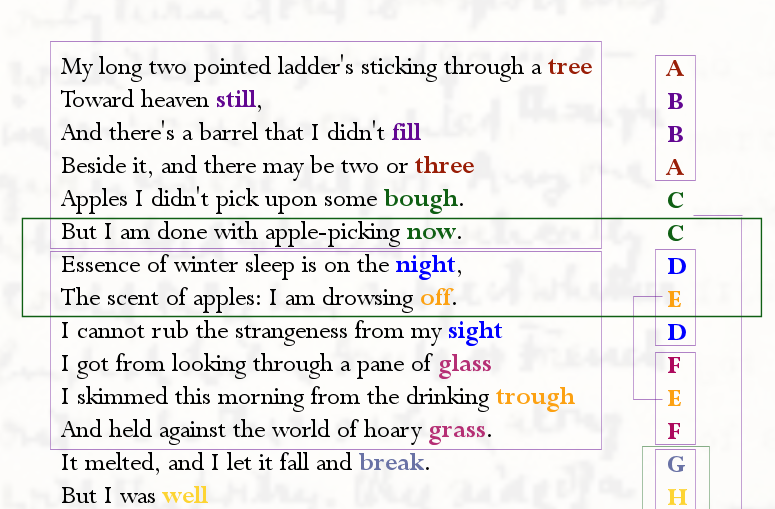 Below is the original scansion: Anapests are blueish and feminine endings are green. If you prefer this scansion (I no longer do), then not only does Frost vary the metrical foot but the entire line. Even so, the two Iambic Trimeter lines (the second and last lines of the quintain) are octasyllabic. No matter how they’re scanned, they don’t vary from the octasyllablic Iambic Tetrameter as they might. The anapests elegantly vary the final lines, reinforcing the colloquial tone – even without dialectal or colloquial phrasing. “You can go along over these rhymes just as if you didn’t know that they were there.” This was a poem “that talks past the rhymes,” he said, and he took it as a compliment when his readers told him they could hear him talking in it. What Newman and Frost neglect to mention is how the meter of the poem amplifies the sense of “talking”. Frost’s use of meter was part and parcel of his genius – and the greatness of his poetry. If this was helpful and if you enjoyed the post, let me know. Comment!